My name is Sabina. The Hijama subject was addressed through a family friend few years back. Alhumdulillah having done Islamic studies (Alima), I had already heard of the practice but wasn’t sure if it was practiced in the UK. This encouraged me to learn more. I started doing a lot of research. To know that you can help someone through a Sunnah was very pleasing to the heart therefore I decided to complete the course on hijama. I studied very close with a Unani herbalist and hijama practitioner with many years of experience. I completed a thorough course in UK covering and incorporating health & lifestyle, anatomy, science, history, Islamic medicine, holistic/alternative medicine & much more, exactly what I wanted. 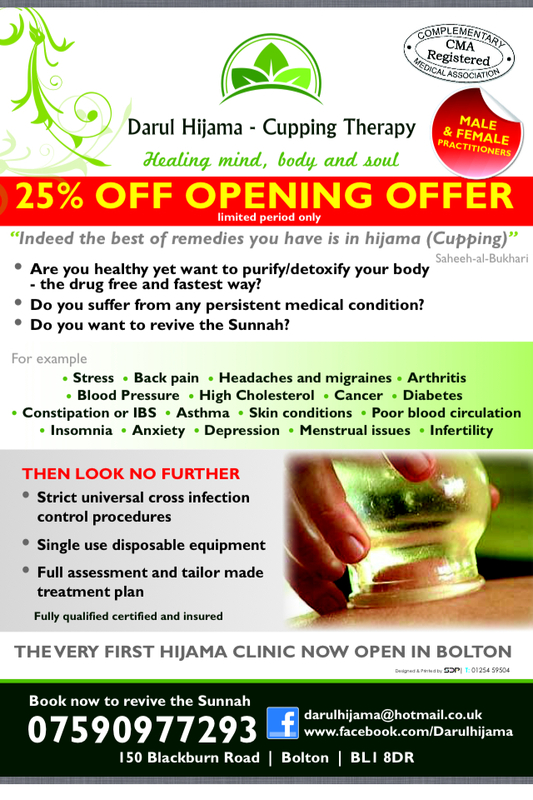 2 years on, I have Alhumdulillah cupped over hundreds of patients throughout the country by doing mobile cupping and now Alhumdulillah opened my first hijama clinic in Bolton – Darul Hijama Cupping Therapy. Yes most definitely, cupping has been used successfully for numerous diseases. The drawing of toxins from the body instantly helps the body regain its energy and stability. Hijama is not just a reactionary medicine for a disease, it is actually a preventative measure that prevents diseases. Hijama helps to remove impurities and stimulates the bone marrow to produce new, healthier blood. It cleanses on a physical, mental, emotional and spiritual level and leaves the patient feeling refreshed and energized. Also patients who suffer from migraines, instant relief for a lot of them and majority have had no migraines since the end of their treatment. Its an excellent body cleanser. once a month for the first three months if the health issue needs more attention. For general health and wellbeing, every four to six months would be fine, more than this would cause no harm. I am always on the go, so I do have hijama done every 6 -8 weeks. This keeps me on my toes, more relaxed, feeling fresh and rejuvenated. I have another female practitioner to perform my cupping, if she is unavailable then my husband gets the go ahead! He’s finished his course too so Alhumdulillah I have nothing to worry about. *circumcision clinic held fortnightly at the premises by a UK registered GP with many years of experience. 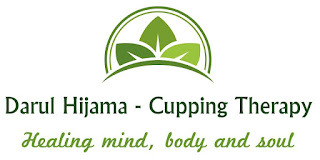 To launch the opening of Darul Hijama Cupping Therapy we are offering 35% off your first treatment to Ahealth blog subscribers until 31 January, 2013 (limited time only)! 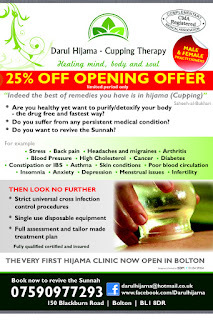 Our thanks to Sabina Patel from Darul Hijama Cupping Therapy Clinic in Bolton for sharing the above post. If you have any questions or want to leave some feedback for her, then please do so via a comment* below.